Pre Draft Mock.....it's the dress rehearsal. Analysis: Cleveland offers their #2, 35th and their 83rd (From Pittsburgh) to move up and take Man......no a swerve... It's Watkins and they have the ammo to do it. the Rams needing a few more players to challenge the NFC Best....jump all over it. It's their draft to control. Analysis: Oakland takes the predictable pick of Robinson now that Evans is off the board. Analysis: Buffalo don't mind the extra baggage Lewan brings to the table. they actually want their lineman to be a little bit nasty. Analysis: Gilbert fills their bill as the top CB. So he heads to Detroit. Detroit would have preferred on of the earlier WRs....but they were just too far down the ladder to be able to jump up and grab. 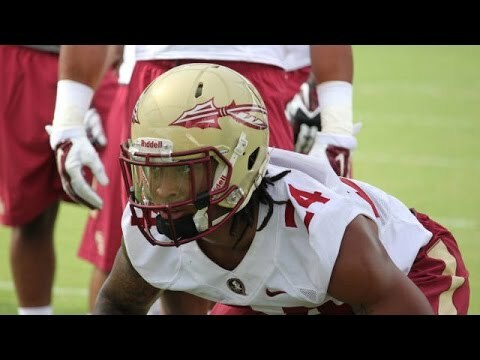 MLB Terrance Smith - Florida St.